An object-oriented approach to Python web development gives you a much more fully-realised experience of the language. The flexibility and power of Python, combined with the improvements in design, coding and software maintenance that object-oriented programming allows, is built to respond to the challenges of increasingly more complex and data-intensive application development, making difficult tasks much more manageable. This book has been designed to make this sophisticated approach to programming easier to learn quickly, providing you with a clear and coherent learning journey. Beginning by looking at a range of design patterns for the _init_() method, you will learn how to effectively use a range of Python s special methods to create classes that integrate with Python s built-in features, and find detailed explorations and demonstrations of callables and contexts, containers and collections, numbers, and decorators and mixins, with a focus on best practices for effective and successful design. The book also features information that demonstrates how to create persistent objects using JSON, YAML, Pickle, CSV, XML, Shelve and SQL and shows you how to transmit objects between processes. Going further into OOP, you ll find expert information on logging, warnings, unit testing as well as working with the command line. 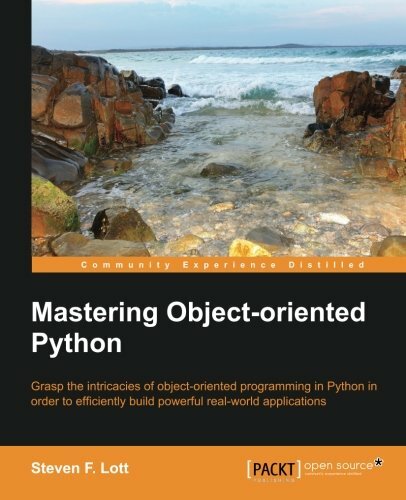 Structured in 3 parts to make the complexity of OOP more manageable - Pythonic Classes via Special Methods, Persistence and Serialization and Testing, Debugging, Deploying, and Maintaining this book offers deep insight into OOP that will help you develop expert level object-oriented Python skills.